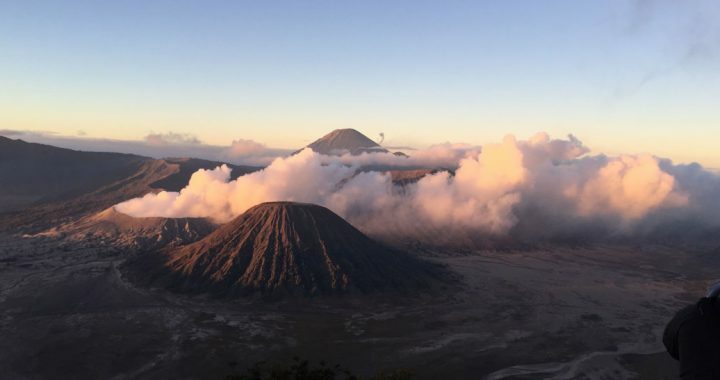 Bromo and Ijen volcanoes are among Indonesia’s greatest attractions. Find here how to visit both of them in a short time, independent and on budget (with details and cost). 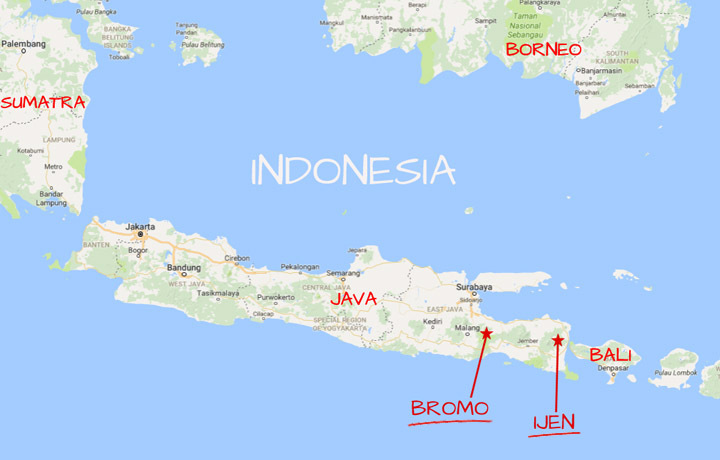 Bromo and Ijen are both located in East Java island at about 200 km from each other. If you consider this a short distance you never travelled in Indonesia. Even with a private transport it will take at least 6 hours to move from one to the other, with public transport consider 9-10 hours (including lead-time). This is why doing both in one day is quite a challenge if you are independent. Yeah, Indonesia is beautiful but transportation slowliness is really frustrating and you easily get the feeling of “losing time” if you have just 2-3 weeks to spend there. But I’m not recommending you to rush for you holidays. If you have time spend two days in Bromo and then go to Ijen. 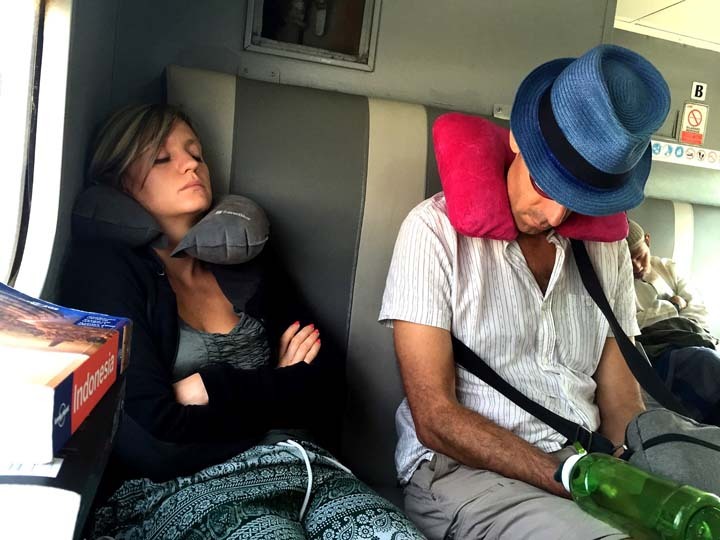 But if you don’t mind spending a lot of time on trains and buses and can go on with little sleep for a while, well you can quite easily do both Bromo and Ijen in one day. Before starting your adventure you need to reach Bromo entry point, Cemoro Lawang. Several tour packages are available to reach it both from Central Java or Bali – I didn’t take them into consideration. I was in Java so I organized my trip from Yogyakarta (that everyone here calls Jogya). Many locals recommended me to travel by train when possible, after doing it I highly recommend too. Yes, they are slow (maybe 30 km/h considering they frequently make long stops) but going by road doesn’t save much time. On the other hand you have better comfort: personal space (vs small and packed vans / buses), air con, no swinging mountain roads. 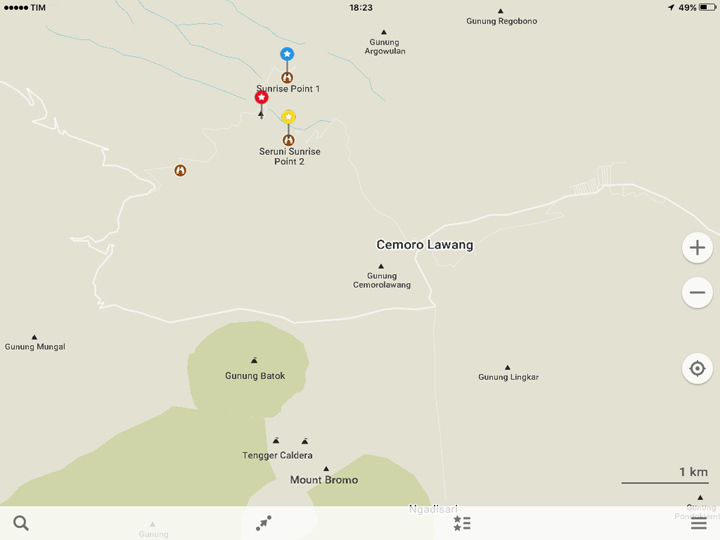 Closest station to Bromo is Probolinggo. It took me 9 hours to get there from Jogya. 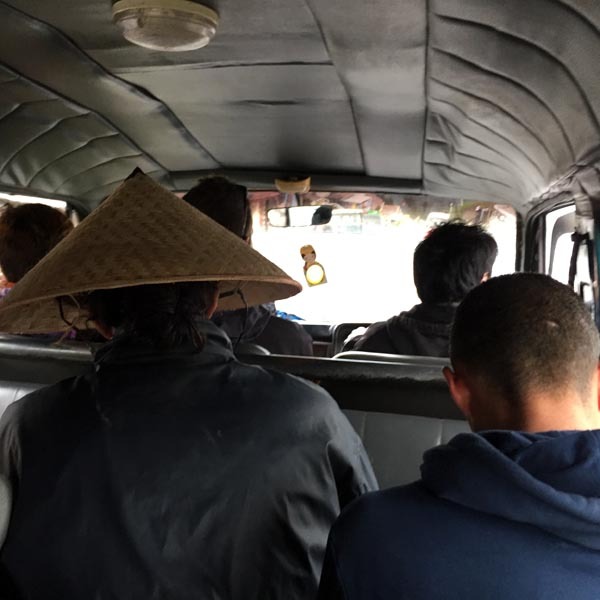 Once there, you’ll need to reach the Minivan station for Cemoro Lawang (next to main Bus terminal, about 15 minutes by angkot – small hop-on hop-off mini-buses). Minivans take about 15 people and they leave only when full, so be preparred to wait. To Cemoro Lawang is a 1 and 1/2 hours drive on mountain roads. You will find some hotel and several homestays in town and the driver will surly propose you some. 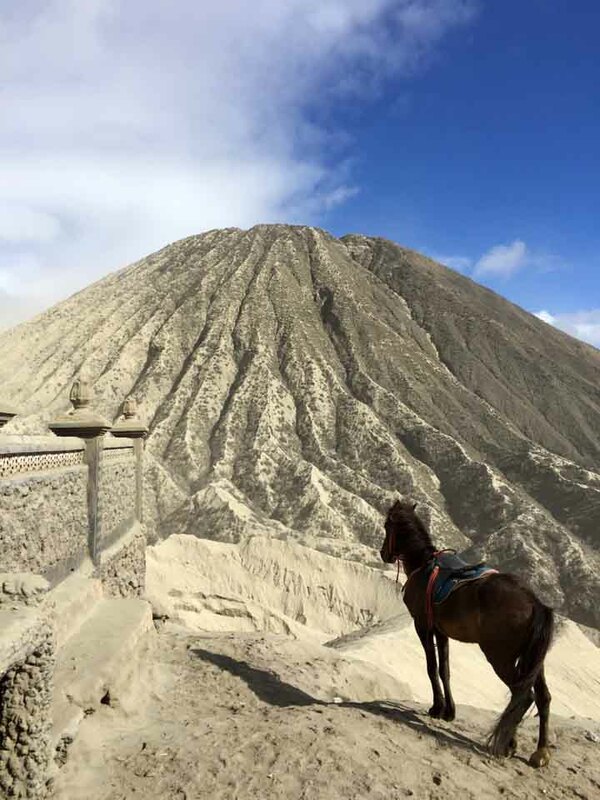 Mount Bromo is a 2,329 metres-high volcano part of Bromo Tengger Semeru National Park. 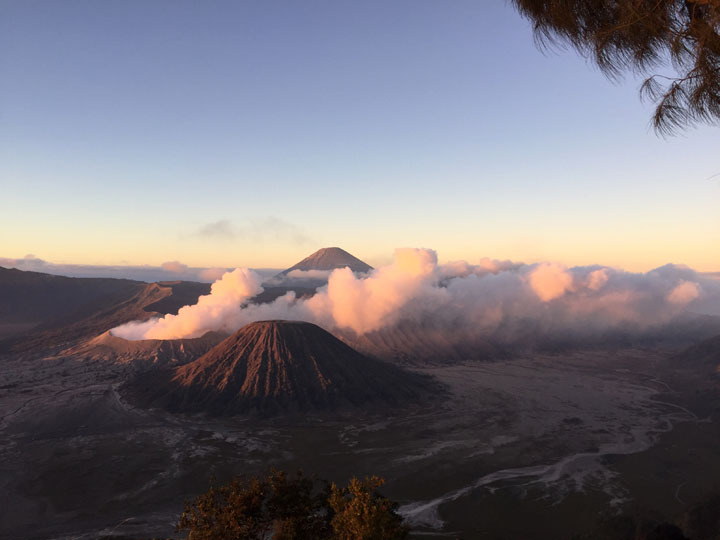 The caldera extend for several km, but most visitors focus on ascending to Mt Bromo crater, crossing the nearby “Sea of sand” and watching sunrise from Mt Panajakan (which offers the best view over the area). You have two options to do that, join a Jeep tour package or climbing/walking on your own. The standard Jeep tour leaves from Cemoro Lawang at about 4 am and takes you to the highest viewpoint on Panajakan. Major con for this option, is that you are surrounded by hundreds people fighting for the best position to see surise. You are very likely not to enjoy it at best. 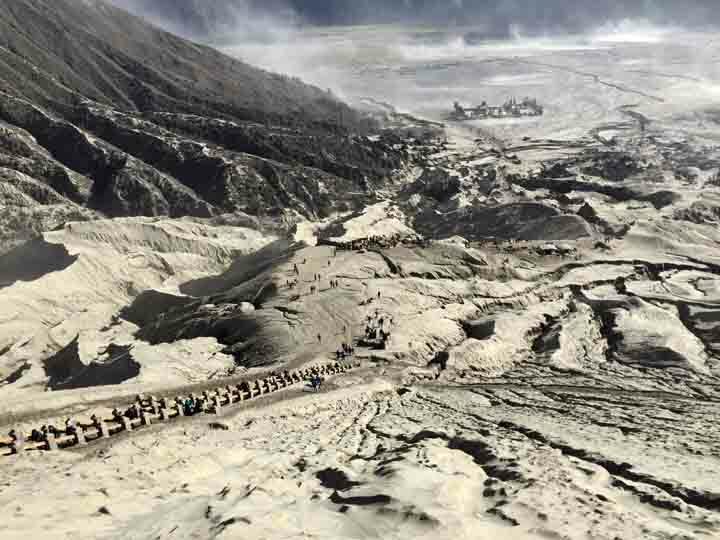 At 6.30 all jeeps go down and take people across the Sea of sand to the base of Mt Bromo. Here you must go on by foot (if you are lazy you can hire a horse for half way). It takes about 20 minutes to climb up to the crater. From the base the Jeep will take you back and drop you in Cemoro Lawang at around 10 am. Again since all the tour follow the same schedule in the morning the crater is crowded. This option need some effort and to skip some sleeping time but is highly worth it. To see sunrise you must leave town at 3 – 3.30 am. You will be climbing Mt Panajakan in the dark therefore you’ll need a headlamp or torch. The path is not indicated but it’s easy to follow. Nevertheless, I recommend to use on your smartphone a offline map app such as Maps.me. It’s basiclally like using Google maps with no need of internet connection (meaning no need for a local SIM card). The following screenshot are taken from Maps.me. It takes about two hours walk to reach the main viewpoint (blu pin), but you don’t want to go there because it’s packed of jeep visitors! 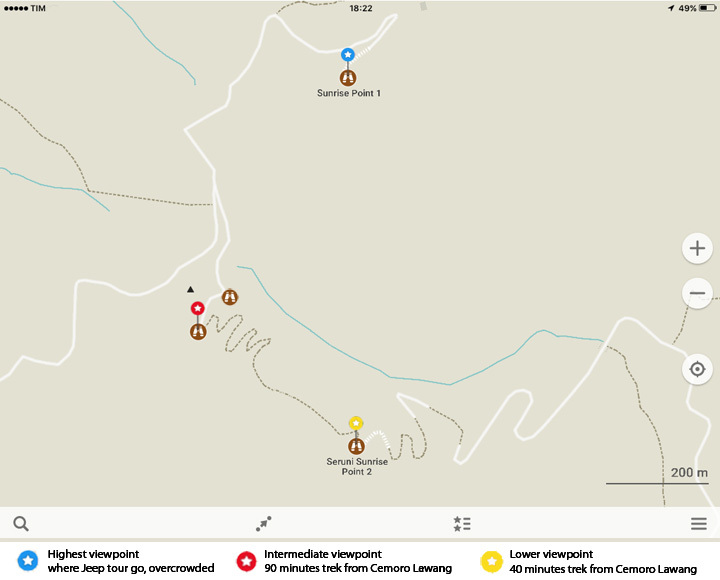 You have two alternatives: a first viewpoint after 40 min walk (Seruni viewpoint – yellow pin), easy to reach, not very crowded but not exciting, and a higher viewpoint (red pin) after 90 min from where you have a great view over Mt Bromo, Mt Batok (in front), Mt Semeru (the big one behind) and the sea-of sand. When I was there in August I counted around 70 people (vs hundreds on Jeep viewpoint). I arrived at 4.30 among the first ones and waited untill 5.30 for sunrise. I later realized that another viewpoint is 5 minutes higher and that both can be reached with 10 minutes walk from the road (so I guess you can organize to get there by car/motorbike but apperently not many do it). 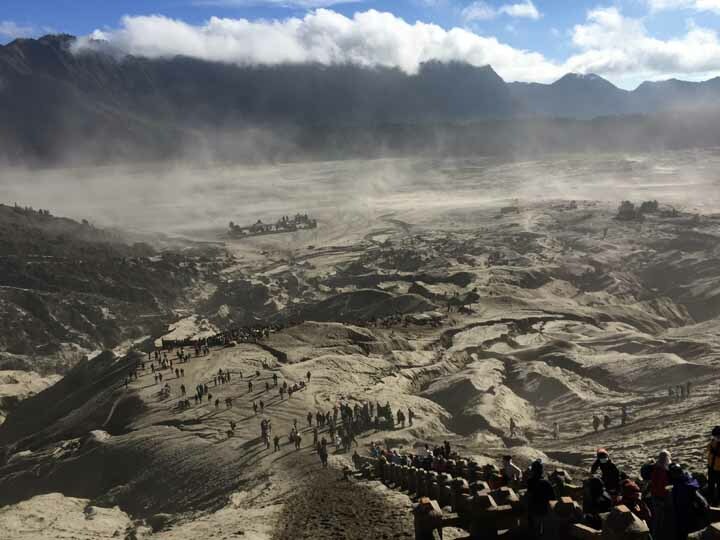 If you can spend two days or more in Bromo there is no need to rush down. Early morning is the peak time to climb Bromo. On the other hand temperature is cooler in that part of the day. From sunrise viewpoint to get to Bromo’s base you need to climb down back and take a path that goes across the Sea of sand (Lautan Pasir). It takes about 2 hours from the intermediate viewpoint. Alternatively, you can do like me. After sunrise with a couple of fellow Italians we went down the main road for 40 min and reached another viewpoint (lower and closer to Mt Batok). From there we took a motorbike taxi (ojek) to Mt Bromo’s base. This helped us to save some time (about 1 and 1/2 hour walking) and reach Bromo’s peak before the wind got too strong. The motorbike ride was an adventure itself, since my driver was riding like a motocross pro. 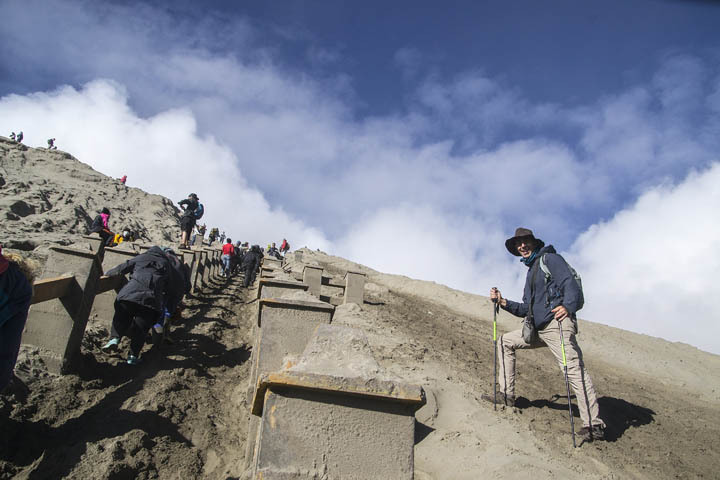 Regardless on how you got to Mt Bromo’s base, you then need to climb up for 20 minutes to reach the crater. There is the opportunity to pay for a horse ride for about half of it but I don’t recommend it. 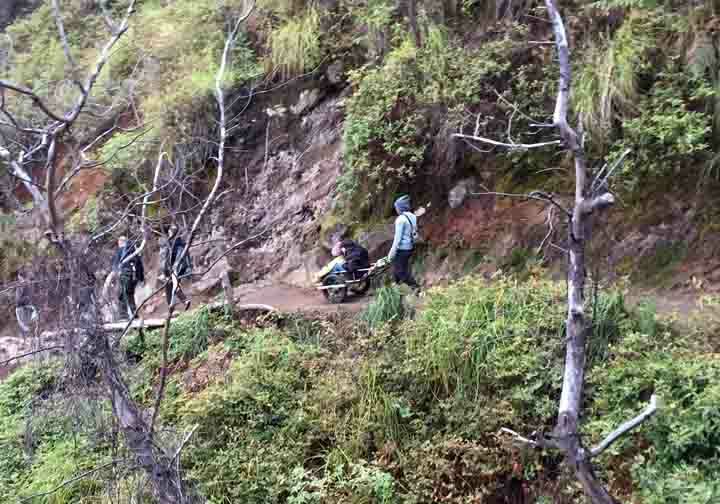 In any case, to reach the crater you will have at last to climb an extremely steep stairway. After that you will be on top and you’ll enjoy an amazing panorama, the moon-looking Sea of sand (with the Hindu temple) and the mountains around. One of Indonesia’s highlights. I was back to Cemorro Lawang at 10 am. I then took a shower, had breakfast, packed and got ready to leave at noon. I took the minivan back to Probolinggo (again had to wait ’till it was full) which is faster on the way down (1 h). Once in Probollinggo I caught the train to Banyuwangi (6,5 h journey), which is the closest town to Ijen area. I talked to some people who took a tour from Bromo to Ijen and they all complained about the uncomfortable trip in a small van, so I guess train is the best option. In Banyuwangi I joined some girls I met before in Jakarta and a local guy who helped me find a Jeep tour to Ijen. 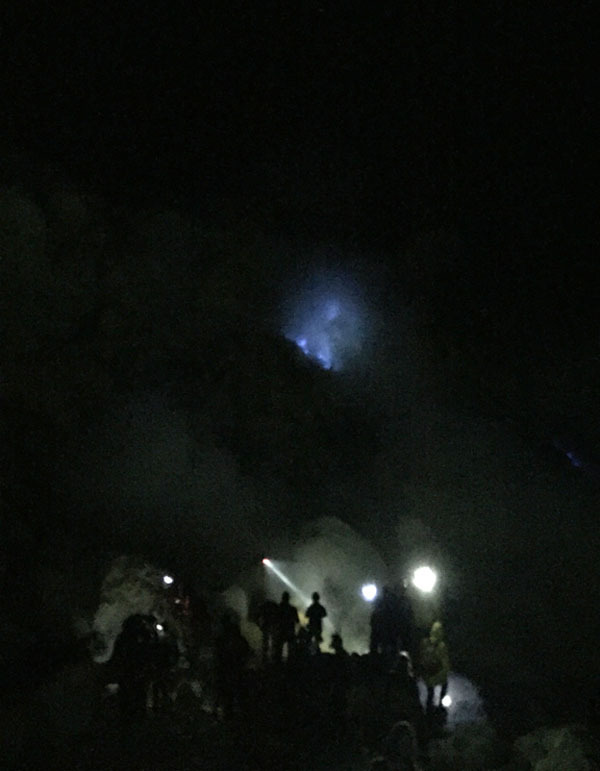 As far as I understood, there is no public transport to reach Ijen at night. The Jeep (for 4-5 people) takes you in 1 h and 15 min to Ijen parking (bumpy road at times). 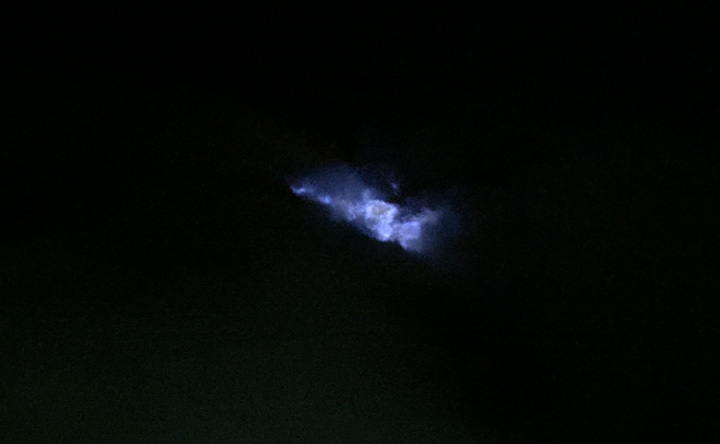 The reason you want to be there at night is to see the blue fire in the crater. Coming with a tour at the Ijen parking you will meet a local guide (mostly useless in my experience, since they give no explaination) and start climbing at around 1.30 am. There is an Entrance fee to pay, which was included in the Jeep tour I took. The path is quite large and it’s impossible to get lost (second reason the guide doesn’t seem necessary). Nevertheless, it’s not easy. The path climbs up very steep (I was happy to use my trekking sticks). It takes about 1 and 1/2 hour (2 km) to reach the top. Because it’s dark you will need a head lamp or torch. If you can’t make it walking you can hire carriers to carry you up on an small cart. I was feeling uncomfortable when seing them, it looked like a scene from slavery times. If you are not fit, just don’t come here. From the top you need to climb down to the crater (about 20 min on a steep stairway). Maybe at this point you are wondering “Is it safe??”. Well, (appearently) there is no eruption danger, but there is a risk from the sulfur fumes (in other countries it would be off-limits). 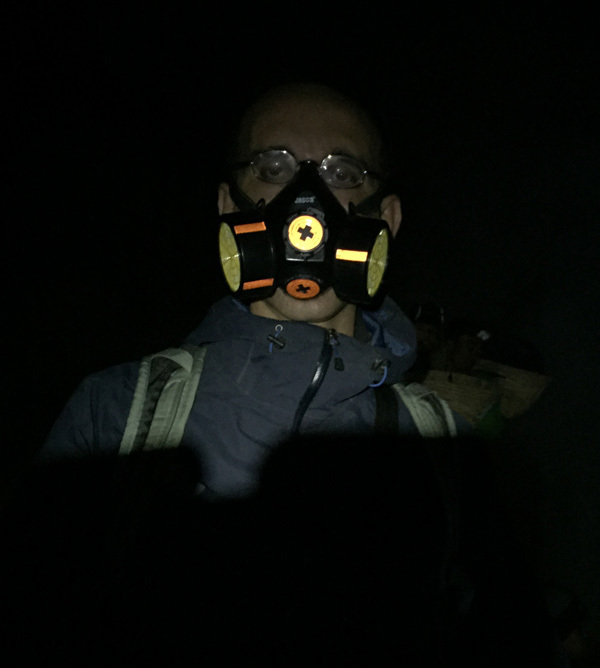 A filtering mask is highly recommended even if not mandatory. Down in the crater the sulfur fumes are really disturbing, don’t risk just to save a few money (mask is included in tours or you can rent one on place). Down in the crater you will see by close the amazing blue fire. It comes from ignited sulphuric gas which emerge from cracks at temperatures up to 600 degrees Celsius and can reach 5 meters high. Be aware that big sulfuric clouds are blown by wind at times, so you might get burning eyes (and lungs, if you don’t wear a gas mask). From the crater you will climb up back to the top to see the rising sun. There is a sunrise viewpoint at 1/2 hour walk. Unfortunately I was there on a cloudy day, so I waited for the sun next to the lake. The waters have a turquoise color due to the fact this is the biggest acid lake in the world (so no swimming!). The sulfur fumes coming from the crater are well visible. 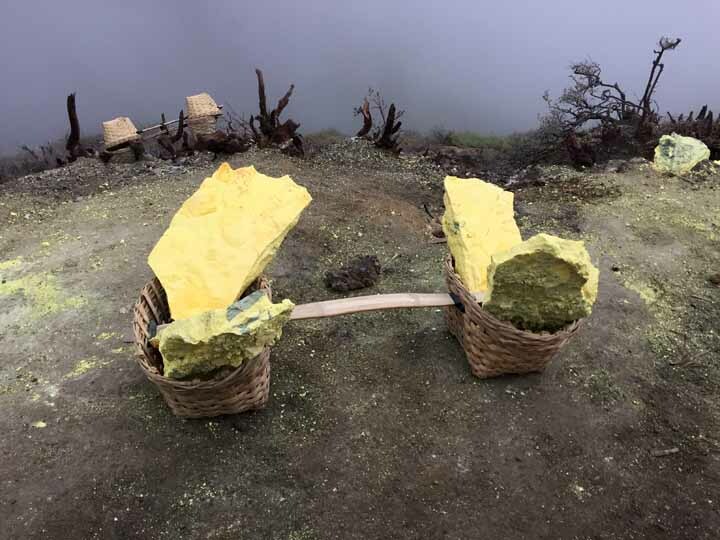 With the daylight you can better realize how hard are is the work for sulfur miners. First of all, because they don’t wear any mask and spend hours in the middle of the noxious fumes. 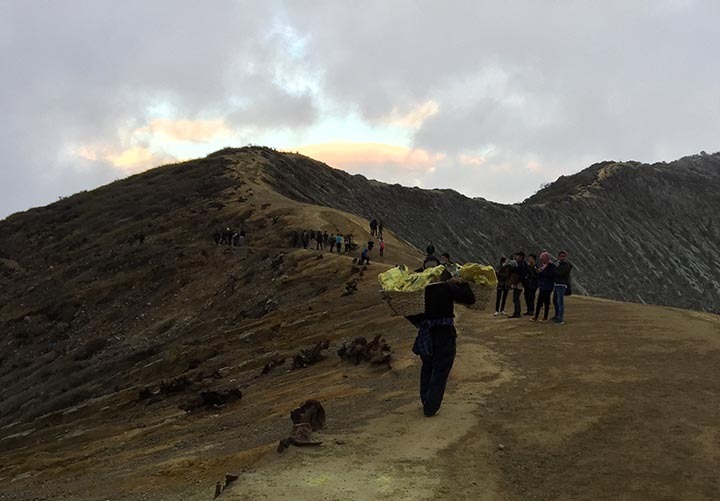 Second, they must carry on their shoulders up to 80 kg sulfur up from the crater and then down to the parking! They are paid only 1.000 rupiah/kg (0,70 €) to perform such an awful task. Normal people cannot even lift the baskets. Some locals sell to turists animal-shaped pieces of sulfur (not really beautiful). After the visit, of course, you need to climb down to the parking and then go back to Banyuwangi (or your next destination). After that, my 27-hour Bromo & Ijen adventure came to an end. Bromo and Ijen fame is well worth. If you come to Indonesia you should not miss them. If you have enough time I recommend to spend two days in Bromo (wish I could). 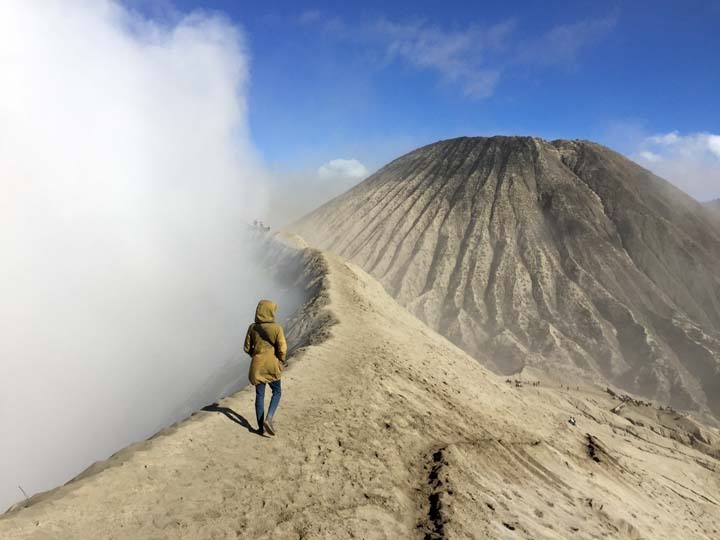 If you really must choose between the two then go for Bromo, the landscape is just breathtaking there. But if you are in for a one day-long adventure you can follow my example. You will get short of sleep for a day but you will maximise your time and enjoy great beauties. That’s all folks about my 27-hour adventure at Bromo & Ijen volcanoes. Did you like this post? Anything to add or ask? Leave a comment! Posted in Travel and tagged adventure, bromo, ijen, indonesia, java, motorbike, sunrise, trekking, volcano. Thank you so much for your post as well as sharing with us your wonderful trip to Bromo and Ijen. It is also amazing that you could fit these two amazingly beautiful places, nearly 200km apart from each other, in a country like Indonesia where the transportation infrastructure is not so well developed. Bravos! I would like to take this opportunity to check with you how you book the tickets for the train in Java as in the post you recommended several time travelling on train rather than bus. Any website where we can check the timing and book the tickets too? Hi Ye, I found the train company website too complicated if you don’t speak indonesian. You can buy tickets either at the station or in any convenience store like Alfamart or Indomaret. Have a good trip Danielle! 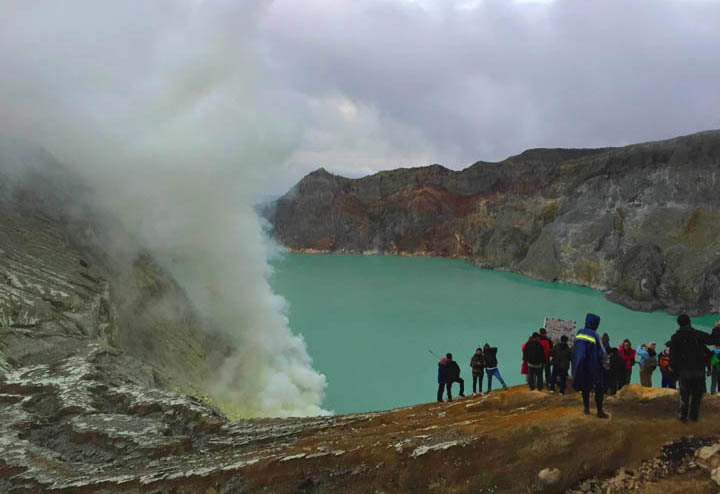 I’m planning on making a day trip to Ijen from Surabaya (say on a Tuesday night) and then to fly back the next day (from either Surabaya or Bali). Do you think it’s possible? Hi Charles, it seems to me hard to do it, unless you have a private transport. Keep in mind public transport in Indonesia is REALLY slow. Good luck! Great info, thanks so much. Just a question. Where do you think I can find the Ijen jeep tour and how much do you think it will cost this July. Any help appreciated. at the bottom of the post you have a cost recap. I spent 250k rupiah. I don’t have anyone to recommend, sorry.